"Fiesta Special. We pay tribute to 30 years of front-drive magic." 30 Years of Fiesta - Special Fiesta Celebration. Fiesta Special. We pay tribute to 30 years of front-drive magic. 1975 - 'Project Bobcat' named as Ford's new supermini model after the idea had been 'kicked' around since the late '60s. 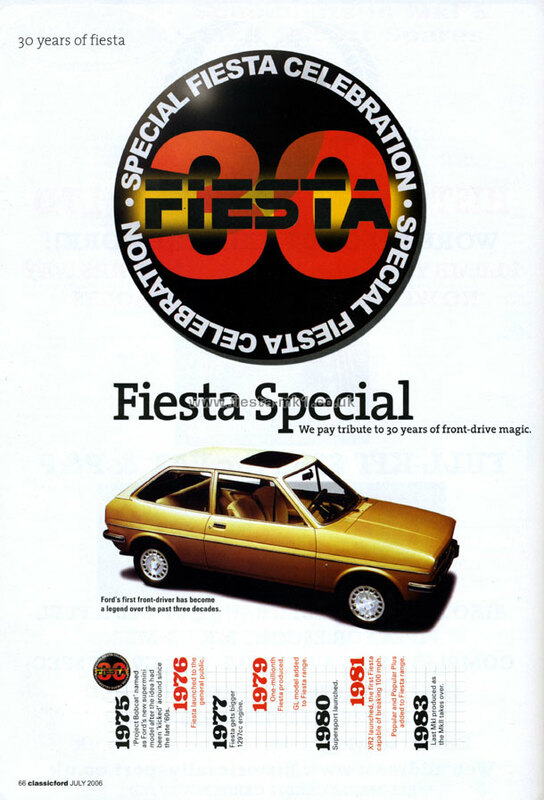 1976 - Fiesta launched to the general public. 1977 - Fiesta gets bigger 1297cc engine. 1979 - One-millionth Fiesta produced. GL model added to Fiesta range. 1981 - XR2 launched, the first Fiesta capable of breaking 100 mph. Popular and Popular Plus added to Fiesta range. 1983 - Last Mkl produced as the Mkll takes over. Middle - Ford's first front-driver has become a legend over the last three decades.